Just a quick post to highlight a few upcoming events in the UK and further afield that may be of interest to literary translators, lovers of Brazilian literature, or Brazilophiles in general. International Translation Dayis an annual event in London (held this year at the British Library) coinciding with the feast of St Jerome, the patron saint of translators. The full-day symposium is targeted at translators, publishers, booksellers, students and librarians and features morning and afternoon seminars, panel discussions, and plenty of room for networking and catching up with fellow translators. Seminars are offered on a range of topics, suitable for everyone from newbies to seasoned pros, on everything from more erudite subjects like literary translation and cultural identity, to leveraging social media or avoiding the poorhouse... I'm looking very forward to being able to attend this event for the first time. Tickets must be purchased in advance (it sold out last year!) and are on sale via the link above. Flipside Festivalshould sound vaguely familiar to anyone who keeps up with the Brazilian literary scene. 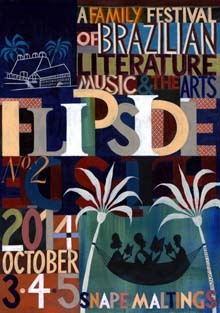 Flipside is the English cousin of the well-known Flip international literaryfestival, held every year in Paraty, in the state of Rio de Janeiro. The inaugural event will feature a weekend of literary events alongside dance and musical performances and tasty Brazilian street food. Several Brazilian writers will be in attendance, including Ferréz, Adriana Lisboa, Milton Hatoum, Bernardo Carvalho and Patricia Melo, as well as award-winning translators Margaret Jull Costa, Daniel Hahn and Stefan Tobler. Plus, how often you can stuff your face with feijoada, brigadeiro and caipirinhas in a place called Snape Maltings (if that's its real name...)? You can read more about the history behind Flip and Flipside in the Independent.